Time for an update on Infinity, as I finish up some other things. First, the Geckos have finally been released! I bought some the instant they were in our FLGS (I got the last box of the first order!) and am drooling over the pieces, biding my time until I can get a colour scheme I am settled on. (By the way; all the squares are centimeters.) Torso back and the backpacks. The alignment nubs socket well, and for the most part the backpack looks like it'll go on securely. I'll probably end up pinning it anyway, mostly because they'll be painted separately and then glued, so a pin will help secure the join. Torso front and legs: The legs look blocky and powerful, which is what an exo-suit would need. You can see in places under the armour-plating the ferro-fibrous muscle bundles, and other than a few places where the flash is sizeable, the casting is fantastic. 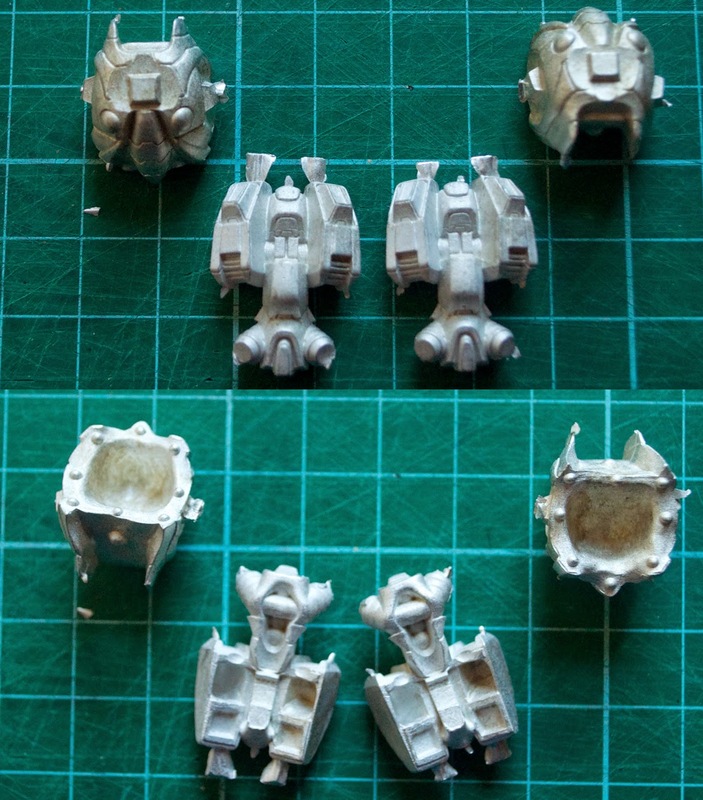 Everything sockets logically, and the shapes are slightly different, so you know which legs go with which torso. The guns! I am a huge fan of the Mk. 12 pose, and I'm becoming more of a fan of the combi-rifle pose as well. These pieces are incredibly detailed and smoothly cast. There's again a few spots where the flashing is in bizarre locations, so be careful before you clip that you're not taking off detail! "The Rest" - All the tiny bits and pieces that go into making the suit work. 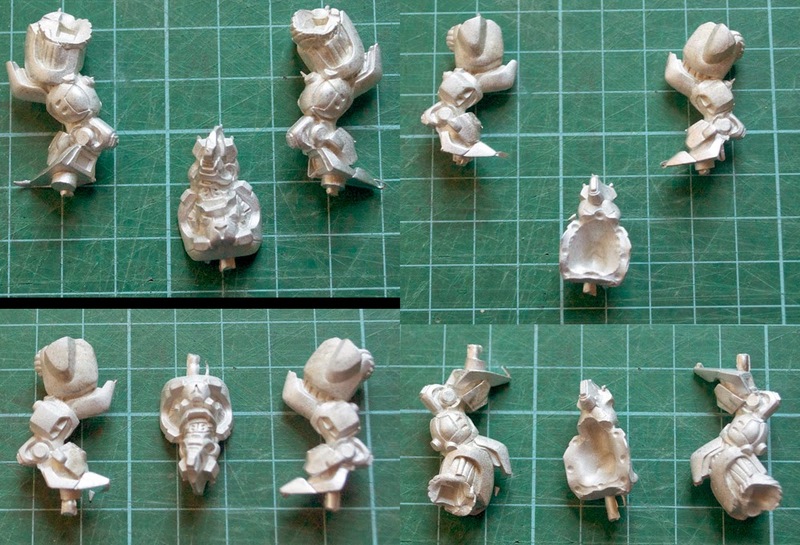 Stubby little person arms, back-toes, the heads, and the chain-colts (thank you Corvus Belli for making those separate pieces!) There's a lot of extra pewter in here. I have a bag sizeable enough I could start making my own models! I've nailed the overall armour colour, I think, and decided to go with deep red pants just for the sake of force unity. The white shoulderpads are also a nod to my final look. I still need to fine-tune their highlights (or more, the shade) and then add all the various military-like patches. 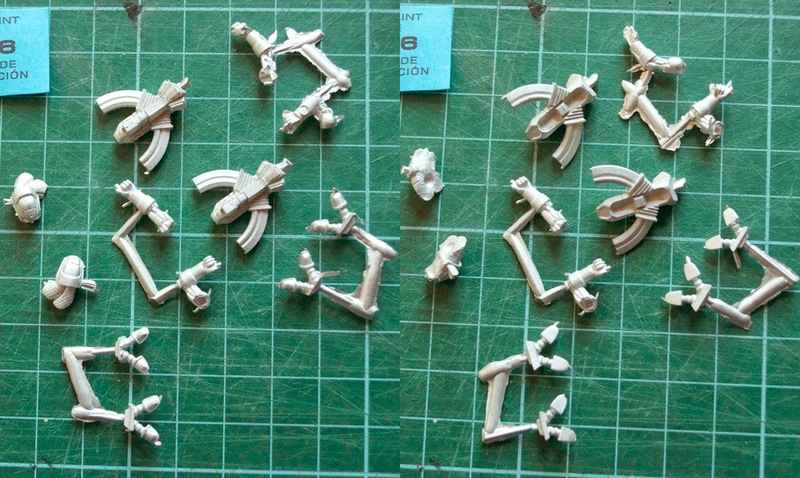 The guns being olive drab I figure is a good way to convey that the guns themselves may get sold to mercenary groups, so a generic colour (and a neutral one) broadens the market. I may fool with that later, and especially with a gun the size of the Spitfire, give it more detail. You can also (possibly) see on his stomach-plate, I tested the hex-armour idea. It does not work. The model overall is too small for the plates to come off looking right, and as a result they end up looking like some weird speckling. Once I've cleared the painting table a bit more, I'll get back around to finishing him up and determining if there's anything I want to adapt. I still think I'm going to make the models that are more 'sneaky' the drab, and then more "aggressive" the red in increased amounts. No way a Hellcat is being stealthy, and a Gecko's not exactly going to hide behind a shrub! I will also, however, be limiting and essentially eliminating the 'glow' aspect of a lot of Infinity models. It's very sci-fi, I know, but it's also a bit silly to have a stealth suit that looks like a raver... Probably just wrist-comms and hacking gear that will end up getting a glow treatment.